Rickenbacker International Corporation - Forum • View topic - RUBY! The 4004 Laredo that was displayed at The NAMM Show is officially mine as of yesterday. Thank you very much to everyone at RIC! Thanks also to Chris and Shelby at Pick Of The Ricks! After 39 years of playing Ricks, it's still very special to get a new one! This one is especially special , the photos do not do this color justice given it's 3D appearance. Here is a quickly made photo that will, hopefully, give you some idea of that. [bThe 4004 Laredo that was displayed at The NAMM Show is officially mine as of yesterday. Technically, I don't think so since he acknowledged that his post was an "echo alert." Therefore, he did not present the words or ideas as his own. Don't forget, I added one of these, too! I'll give you one these too!! I agree--the white binding really makes the ruby color stand out! I love it! For some reason, Rickenbacker does an exceptional job with red finishes. Fire-glo, Burgundy-glo, Ruby--all are truly gorgeous guitar finishes. Now I just have to figure out how to start saving up for a 620 in Ruby! ...as much as I hate the guitar/car comparison, the "blacked out" looked with cars is very popular. Grills, rims, trim, etc all black is very cool looking. I've seen it more with upscale SUVs than cars. There are several video games that allow you to customize every aspect of your vehicle, and I like the idea of taking every aesthetic part of a vehicle the same color. Too see it done with a guitar would be groundbreaking, in a sense. I have seen bodies and even headstocks that have every detail blacked out or the same color, but never an entire instrument (Unless you count brass instruments being painted). 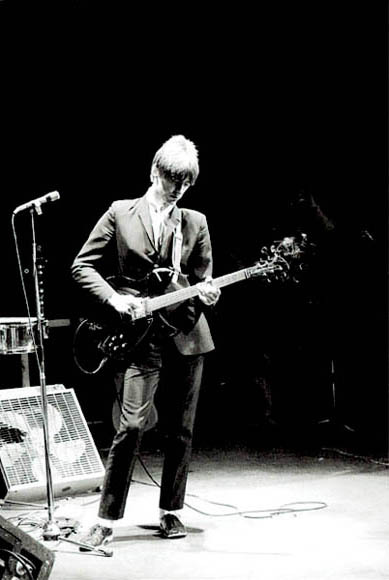 Um... Paul Weller's black 330 with black trim? Yeah, it's not unprecedented. A lot of metal shredders have single-color instruments, too. All black is very big with pointy guitars. Maybe there really are no original ideas anymore. Gorgeous! Can't take my eyes of that 360 shining in the pic. Aside from one FireGlo 4003, and my Trans Green Cii, every Ric I've ever owned has been either MapleGlo or JetGlo. Until now- as I am the very proud owner of a 2012 Ruby 330 guitar. It's only my 9th thus far, but the most stunning color I've seen from Ric since BlueBurst. Thank you all at Ric, still a happy customer.